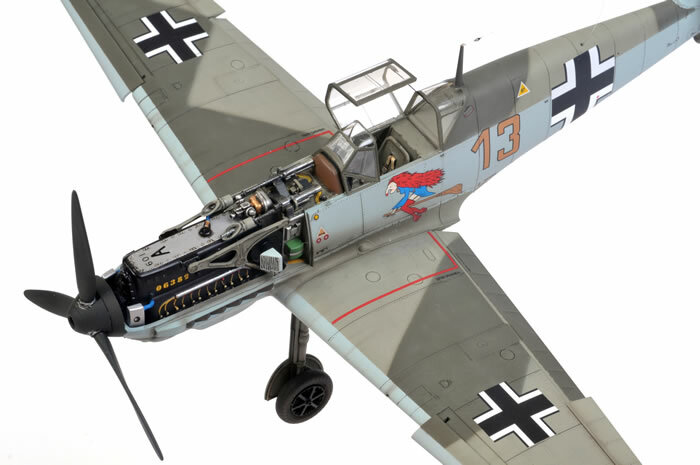 Here is my 1/48 scale Eduard Messerschmitt Bf 109 E-1. I reviewed this kit last Friday and started work on it almost straight away, finishing yesterday afternoon. The cockpit looks great with its colour photo-etched parts. 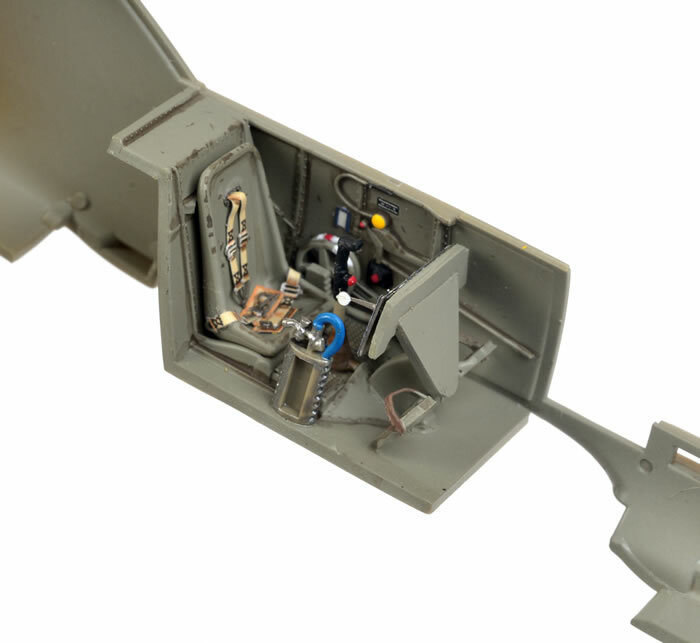 Detail is to the same level as the 1/32 scale kit. 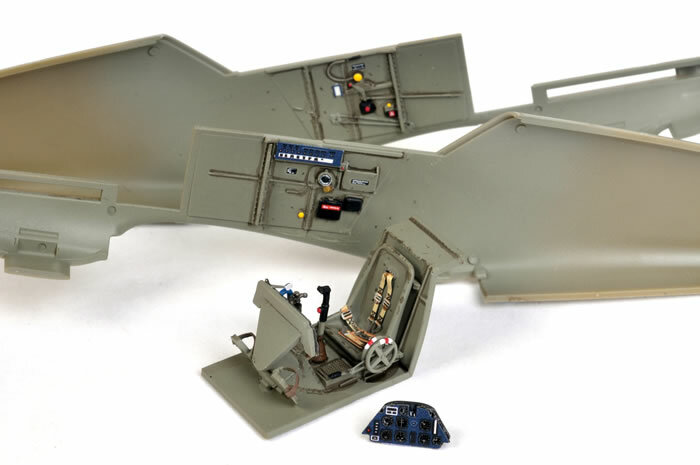 Apart from the addition of a few Aeroscale cockpit placard decals, the cockpit is built straight from the box. By the way, the very blue cast of the RLM 66 parts seems to be due to the colour balance of my studio lights. They are nowhere near that blue in real life. I have fiddled around with the colour temperature settings on my camera since taking these in-progress photos. I was painting on the weekend while the family was in the house, so I weathered with an acrylic Citadel "Devlan Mud" wash instead of the smelly oil-based washes that I would usually use. The acrylic wash was okay, but lacked some of the subtlety and smoother blending of an oil wash.
My original plan was to build this model with the engine cowling glued in place, but I was so impressed with the detail as I built up the engine block that I decided to display it on the finished model. I spent around an extra day painting the engine. The engine is built straight from the box. Eduard supplies four sets of individual yellow stencil-style digits (0-9) for the engine serial number. I found a number of photos of DB 601 engines that appeared to have a bare metal top engine cover, so I decided this would add a bit of interest. I also found photos of later engines with the engine model number painted on the top cover, so I thought I would apply a little artistic license and do the same with mine. The "601" and "A" decals were sourced from an old unlabelled sheet of serial numbers, which I think came from Fantasy Printshop. Hey, it reads "109" when it is upside down - spooky! The engineering and parts breakdown is essentially the same as the 1/32 scale kit but my impression is that the fit is slightly better. 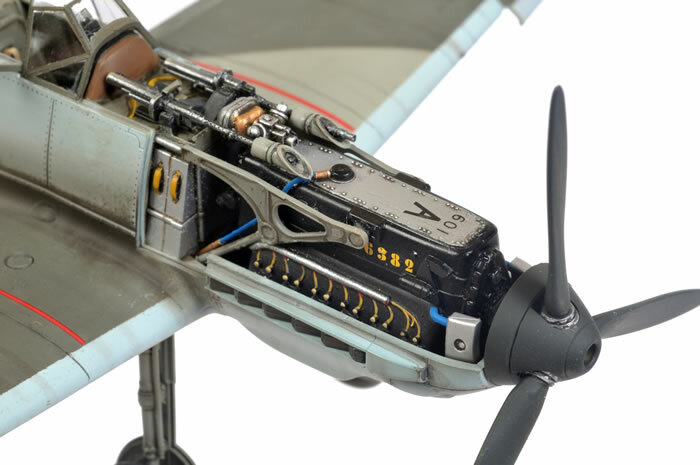 There are a few interesting changes to the engineering though, such as the three-piece tail wheel assembly trapped between the empennage halves and the new, more precise and robust method for securing the horseshoe oil cooler. BTW, in my review last week I mentioned a sink mark on the rear cover for the instrument panel. In fact, it is not a sink mark - it is actually a moulded recess for the back of one of the cowl machine guns. I should have remembered this from the 1/32 scale kit! The fit of the kit was very impressive, although getting the assembled engine / firewall / gun deck assembly between the fuselage halves is a bit tricky. The exhausts actually hold the engine very securely and accurately in place by themselves, so next time I will probably attach the mounts to the engine but not glue them to the firewall. That way, the engine could be fitted first, and the firewall could be added later. 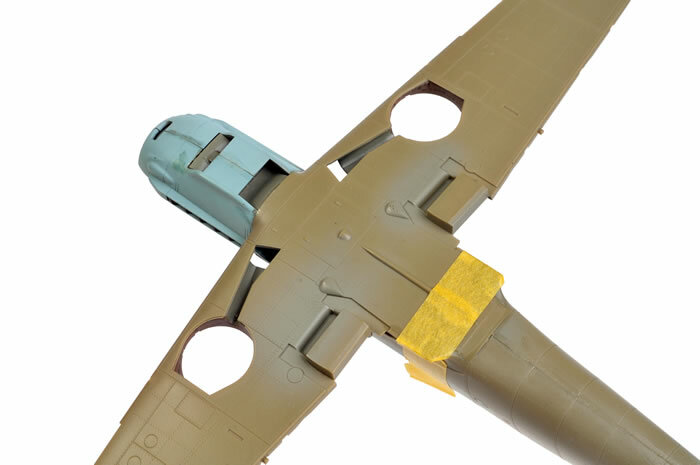 Along similar lines, I did not install the cockpit floor section until after the fuselage halves were joined. Once the fuselage was set, I simply pushed the cockpit floor up through the hole in the bottom of the fuselage and it clicked into place. I also deviated from the instructions with the wing assembly. I glued the full-span lower wing half to the fuselage and made sure the dihedral and general fit was set before adding the upper wing halves. 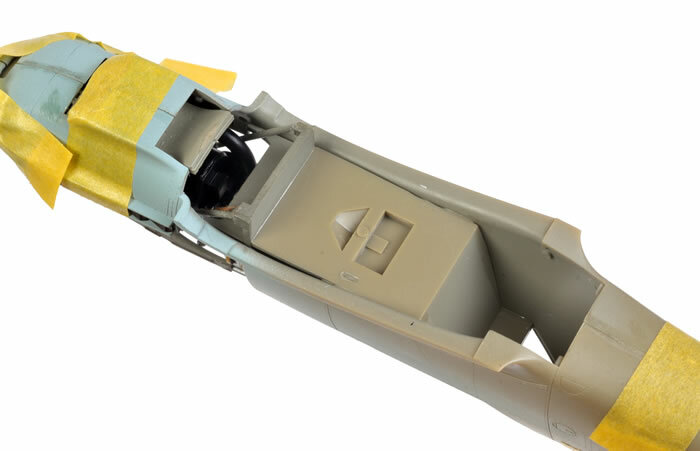 Dihedral is good, the upper parts sit down properly over the wheel well linings and there is no gap at the wing root. The balance of construction was very straightforward. I chose one of the kit decal options, Kurt Ubben's mount from 6. (J)/Tragergruppe 186 based at Wangerooge Germany in March 1940. 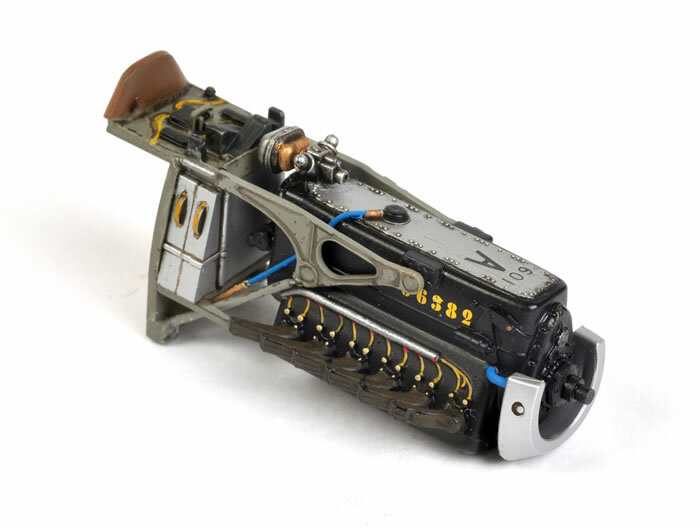 This unit was responsible for the early defence against RAF bomber raids. As this was a home-based aircraft, I kept weathering fairly light. 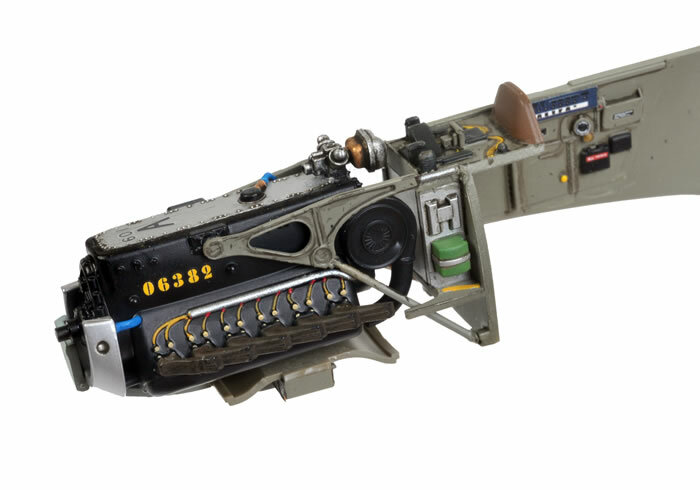 In summary, the model was built entirely from the box apart from the decals from Aeroscale for the cockpit placards and Fantasy Printshop on the top of the engine. I will write up this build and the paint job in more detail for an article in Issue 13 of Military Illustrated Modeller magazine. 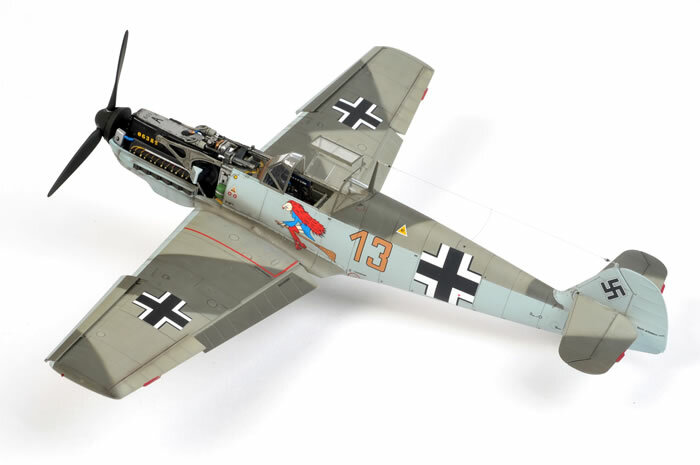 In the meantime, though, I can confidently advise that Eduard's new 1/48 scale Messerschmitt Bf 109 E-1 is a beautifully detailed kit and a pleasure to build.